Chloe was bred to Hawk on July 7 - 10, 2016. Chloe is qualified all-age and has earned the GRCA CCA. She is curently running all-age stakes. Hawk earned 61 derby points, making him the second highest all time Golden derby dog. Hawk is also all-age qualified and running all-age stakes. The puppies were whelped on September 11, 2016 and received early neurological stimulation from day 3 until day 16. 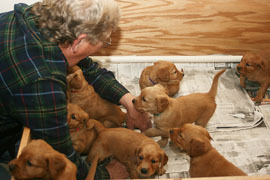 The puppies were socialized from week 4 until they were sent to their new homes. At this time they were also exposed to the sounds of human activities. Once the puppies were weaned, they were exposed to different environments and at the end of week 6, they were exposed to birds. The puppies were fast learners and should be great performance dogs. Before the puppies were sent to their new home, they were examined by a veterinarian, had their dewclaws removed, were wormed and received their first shots. 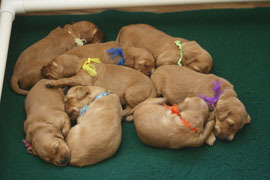 The puppies also had an implanted ISO microchip that is recognized in many countries including the United States and Canada. We are planning a repeat breeding. If you are interested, please contact Paul at Birch Bay Retrievers. All puppies are sold with a warranty that can be viewed in the sample sales contract. 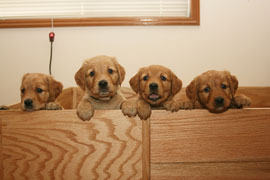 We also donate a portion of the purchase price to the Golden Retriever Foundation.